In 1267-68, at the request of Pope Clement IV, Bacon published three major works: Opus Majus, Opus Minus, and Opus Tertium, in which he proposed educational reforms based on the value of observation and measurement of nature. He recommended that the study of languages, mathematics, alchemy and experimental science should replace the traditional medieval university curriculum. In Opus Majus, he attempted to join all learning, wisdom and faith in a unified conception. In 1272, he published the Compendium of the Study of Philosophy, in which he harshly criticized the philosophical methods of his contemporaries. 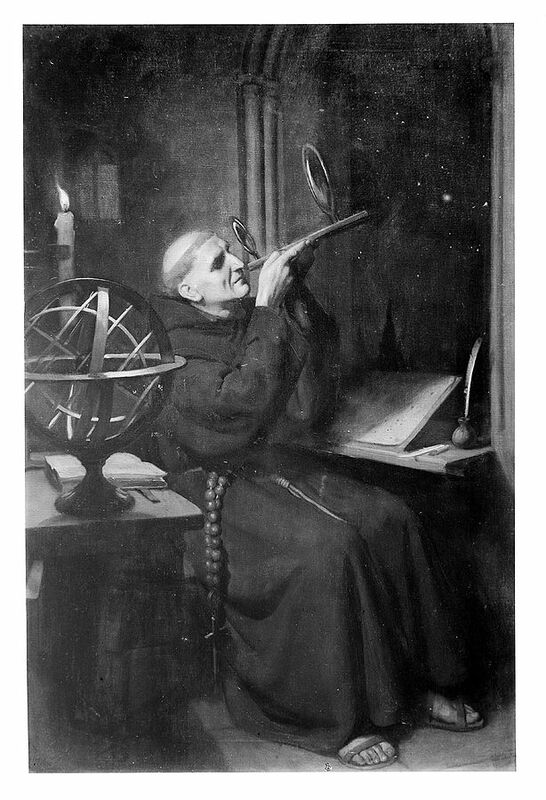 His advocacy of empiricism over the dogmatic scholasticism of his day, coupled with accusations of teachings just short of heresy led to his imprisonment by order of the Franciscan minister-general for several years in the 1270’s. In 1292, he published the Compendium of the Study of Theology, in which his criticism was directed toward the theological methods of his contemporaries. After his death, he began to be spoken of as having been a sorcerer and/or a miracle-worker. Some attribute the invention of black powder (outside of China), the camera, the clock, the telescope and steam power to Bacon. He was referred to as “Doctor Mirabilis” by his alchemical admirers.